Originally published under the title "CAIR's Help For San Bernardino Terror Family Resembles Palestinian Policies Of Jihad Benefits." In the immediate aftermath of the San Bernardino terrorist attack, the Council on American-Islamic Relations (CAIR) sought to support and assist the families of the terrorist Syed Farook – before the FBI had even uttered the word "terrorism." As my colleague Joel Pollak writes at Breitbart California, the organisation, which claims it is tasked with improving relations between America and its Muslim communities took the pre-emptive step of representing Mr. Farook's family, in what Pollak describes as a terrorist family's "death benefit." CAIR's assistance and public representation of Syed Farook's family, in my opinion, closely resembles the Palestinian Authority's (PA) behaviour of rewarding imprisoned terrorists, or, in cases where they've died during an attack, their families. The PA has used U.S. and UK foreign aid for these "salaries," paid during incarceration, or, in the case of the families, for the foreseeable future. 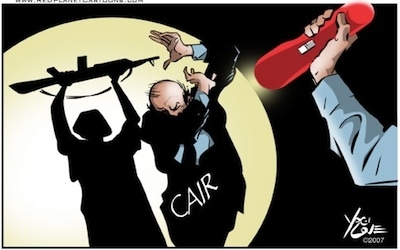 CAIR issued a press release drawing attention to its role, almost as if legal assistance were a kind of death benefit offered to would-be terrorists, ensuring their children's welfare. CAIR's actions do not meet the legal definition of "accessory after the fact." But helping terrorists' families, and broadcasting their political message–common practices of regimes that support terror, like the Palestinian Authority–is an odd way to carry out CAIR's mission of improving "American-Islamic relations." If anything, CAIR's actions are calculated to inflame those relations. The similarities are stark, if you consider the work produced by the Palestinian Media Watch (PMW) organisation. The Palestinian Authority's actions are often funded by American and British tax payer-funded aid. The PA in August 2014 announced that it had closed its Ministry of Prisoners Affairs, which funneled monthly salaries to terrorists, because of pressure from Western donors. Rather than a PA ministry, a PLO [Palestine Liberation Organization] Commission of Prisoners Affairs – purportedly independent of the PA and its funding – was set up to pay the salaries. The international community, according to the report, largely accepted these changes as assurance the PA was no longer paying salaries to terrorists. "However," the report read, "the PLO commission was new only in name. The PLO body would have the same responsibilities and pay the exact same amounts of salaries to prisoners; the former PA minister of prisoners affairs, Issa Karake, became the director of the new PLO commission and PA President Mahmoud Abbas retained overall supervision of the PLO Commission." The Palestinian Authority declined to comment on the report. According to the report, based on comments made by Palestinian officials, the perpetually financially strapped PA spent $144 million in 2014 paying salaries to incarcerated and released prisoners. The issue dates back to 2011, when PMW's Itamar Marcus noted: "The Palestinian Authority pays monthly salaries to 5,500 prisoners in Israeli prisons, including terrorists.,"
[I]t is still a shock to most in Congress and many in Britain's Parliament, who are unaware that money going to the Palestinian Authority is regularly diverted to a program that systematically rewards convicted prisoners with generous salaries. These transactions in fact violate American and British laws that prohibit US funding from benefiting terrorists. More than that, they could be seen as incentivizing murder and terror against innocent civilians. This report was confirmed by the Telegraph, while in 2012 the Daily Mail published a report entitled "Palestinian prisoners are handed millions in British aid with some being paid more than average UK worker," revealing that the PA "is paying [terrorist prisoners] up to £1,957 a month" (full disclosure, I was quoted in this article on the subject). Sir Gerald Howarth, a Member of the British Parliament said in 2014: "The Palestinian Authority is putting two fingers up to the British taxpayer... It is not the job of the hardworking British taxpayer to fund payments to terrorists." CAIR may not be paying terrorists' families "salaries," but it has offered a sort of benefit in kind via its Los Angeles Chapter. Given what we now know about Syed Farook's mother, and the fact that his father was just recently placed on the terror watch list, we have to wonder if CAIR's motivations lean towards improving relations between Muslim communities and America or providing a public relations outfit for Islam and the families of the terrorists involved in the San Bernardino atrocity.